London was uncommonly chilly this April, as delegates to the Spring 2015 International Vision Standards meeting will testify. But inside the conference rooms at the St. Giles Hotel in London, the temperature was somewhat warmer, as engineers from around the world hotly debated what enhancements should be added to the current standard software and hardware interfaces used in the vision systems industry. Aside from tackling the standards issues, the forum also provided the opportunity for engineers from camera, frame grabber and software companies to obtain independent confirmation that their products were interoperable in what has now become known as the twice yearly “PlugFest”. 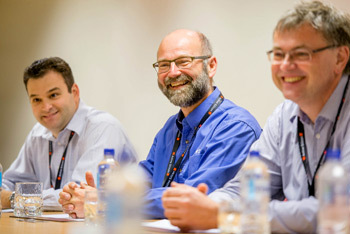 During the weeklong event -- which was hosted by Active Silicon and sponsored by Novus Light Technologies Today and the European Machine Vision Association (EMVA) -- the chairs of the major industrial vision standards took part in an exclusive forum in which they set out their roadmaps for the future. Many people who use the vision technologies discussed during the week long meetings -- and at the forum -- cannot realize the amount of time and effort that the engineers from many of the industry’s leading companies put into defining these standards, as they set aside their competitive instincts to ensure the future compatibility of next-generation vision systems. 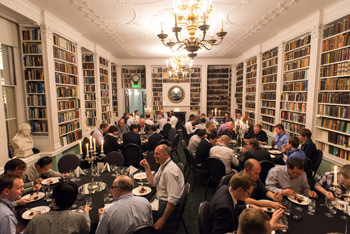 On this occasion, the delegates were rewarded for their labor by being treated to a five-star dinner organized by the hosts Active Silicon and sponsor Novus Light Technologies Today at the illustrious Royal Institution in London, the home to the Faraday museum. It was a chance for many to reflect upon the achievements that had been made by scientists over a hundred years ago that built the foundations of the technology upon which we stand today. Looking back at developments in the vision industry over the years, Active Silicon’s Chris Beynon acknowledged the role that software now plays when defining the functionality of all vision systems’ interfaces. While mature standards like Camera Link predominantly only defined the functions of a vision system interface in hardware, since the advent of the GenICam software standard, the functionality of all the contemporary vision systems interfaces are now guided by enhancements to that software specification which the underlying interface standards then support. Clearly, by enabling any potential modifications to the GenICam specifications to be reviewed by engineers at meetings such as the International Vision Standards meetings, the future interoperability of all the vision systems interfaces discussed at the forum, will -- hopefully -- be guaranteed. Present during the meeting were Chris Beynon from Active Silicon (representing CoaXPress), Eric Carey from Teledyne Dalsa (representing GigE Vision), Reynold Dodson from BitFlow (representing Camera Link), Mike Miethig from Teledyne Dalsa (representing Camera Link HS), Eric Gross from National Instruments (representing USB3 Vision) and Friedrich Dierks from Basler (representing GenICam). 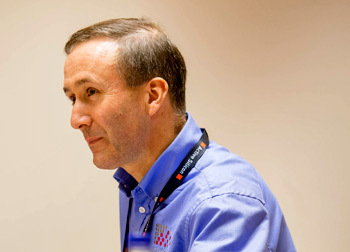 At the forum itself, Active Silicon’s Chief Technical Officer Chris Beynon kicked off the session to describe the current state of play with CoaXPress, an asymmetric high speed serial communication standard over coaxial cable that his company developed with Adimec and EqcoLogic. Version 1.0 of CoaXPress has been available for several years, and most of the systems that are currently deployed in the industry conform to it. Various minor improvements were added to Version 1.1, which was released 18 months ago, and Version 1.1 products are now starting to hit the marketplace. However, the CoaXPress standards committee is not resting on its laurels, as no fewer than two future standard versions are currently being defined. Version 1.2 of the specification should be out this summer, which will have detail changes to aid developers, and will also pave the way for higher speeds to be added. Looking ahead to the future, the standards committee is also working on releasing Version 2.0 of the CoaXPress specification in 2016. Chris Beynon says that the new specification concentrates on speed. “At present, the specification enables cameras to transfer data to a host at a maximum speed of 6.25Gbit/sec per cable. But Version 2 will define speeds of 10GBit/sec and 12.5GBit/sec. If that isn’t fast enough, the new standard will also enable users of the interface to connect more than one frame grabber to a camera,” said Beynon. Version 2.0 will add several other enhancements. 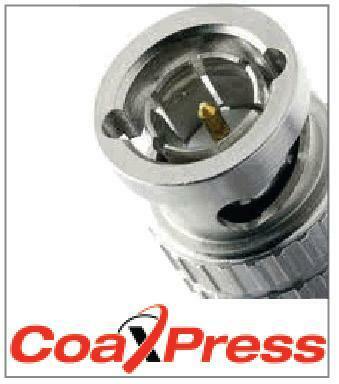 According to Active Silicon’s Beynon, the first will be to add error correction to enhance the CoaXPress link. To provide such a mechanism, a very low data overhead scheme has been developed that will support forward error correction, enabling any single bit errors and a limited number of multi-bit errors per packet to be corrected. Another important addition to the standard will be the support for GenICam events. This is a useful, because it will enable GenICam compatible devices, such as cameras, to deliver asynchronous messages across the CoaXPress interface enabling cameras to inform a host of their current status. Lastly, the new specification will also see support for 3D standards. To do so, it will support the 3D enhancements that have been made over the past few years by the GenICam software standards committee. For 99% of all very high speed vision applications, Beynon believes that a coax interface is ideal for multi-Gbyte/sec vision systems requiring cable lengths in the 5 to 25m range. But for some applications, interface cable lengths of hundreds of meters in length are required. Due to that fact, the CoaXPress standards committee is carefully following the work of the Japan Industrial Imaging Association (JIIA) who are currently developing a variety of optical interfaces that might eventually be supported in the CoaXPress standard. To continue reading, click on the individual standards below. The Camera Link interface standard is a well established vision interface. Since the ratification of the standard in May 2006, GigE Vision has become one of the most prominent interface standards used by developers of vision systems. Since the advent of the GenICam standard, a means now exists to configure devices across a wide range of standard physical interfaces at a higher level, regardless of the camera type and image format. 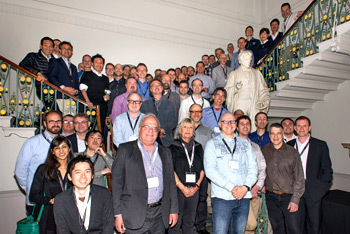 The International Vision Standards Meeting (IVSM) was hosted by Active Silicon, sponsored by the European Machine Vision Association (EMVA). The exclusive media sponsor was Novus Light Technologies Today.